Kitchen & Bath Galleries has been providing Walker DesignBuild customers with appliances since conception. We have set up a great basic package of appliances, but they allow the home buyer the opportunity to make changes. Walker DesignBuild is built around customer relations and service. Attention to detail is very important to them, and it is noticeable during walk throughs of their homes. I always reinforce to Walker DesignBuild’s home buyers that they have chosen an excellent builder and that they will be very satisfied with the process and end product. When we toured Sunset Bluffs, we visited several spec homes and found that the one built by Walker DesignBuild had everything we were looking for at a great price. The design was well thought out and the home included a sealed crawlspace, tankless water heater, a fence, and other desirable features. Mr. Walker spent more than an hour showing us the house and it was clear that he stood 100% behind his work. The biggest strength of Walker DesignBuild is the family feel and character of the company. Everyone was responsive to all of our requests and were proactive in helping us throughout the entire process. During the final walk-through, we received a beautifully organized package with all of the information we needed, including vendor and warranty information. We absolutely love our new home and look forward to making many memories here. We were relocating from out of state and did most of our real estate research online. After scheduling a visit to the sales office at Amberly, we were given information on all of the builders in that community, including Walker DesignBuild. It was immediately clear to us that the finishes that Walker DesignBuild offered were much more customized than those of many of the national builders. In seeing their model home, we noticed right away the real hardwood floors, high quality kitchen cabinets, fully tiled shower walls, coffered ceilings, and many more custom details that were very appealing to us. The home we selected was already under construction, but we were able to make many of our own design selections. As an out of town customer, we had to handle most of our communication via email, and we found that Karen was very responsive to our needs. We were even able to set up an appointment with Randy over Labor Day weekend to accommodate our limited availability to be in town for walk-throughs. The building process was very organized and at closing we were given a binder that included essential information we would need for our new home. This has already been a useful resource! Customer service was definitely a big plus of working with Walker DesignBuild. We are very happy with our home. We love that the house was custom designed with all of the fine details that were important to us. I have known Randy and his team since 2005. Walker DesignBuild was one of the top custom builders that we represented in Cameron Pond, Highcroft/Highcroft Village, and Weycroft. I have always been impressed with their attention to detail, which probably stems from Randy’s engineering background from Virginia Tech. The trim packages, screened porch details, front doors, front porches, and usable 3rd floors (where applicable) are all outstanding selling points for their homes. They even give the landscaping their full attention by sodding the entire yard, and installing nice plants and mulch. This gives their homes beautiful curb appeal. Their homes are priced extremely competitively and include an extended warranty, which is something many local builders don’t do. With Walker DesignBuild, it’s about people first and they are truly invested in the area. They live and work here and consider their customers their business partners. We actually stumbled into finding our new home! We were relocating to the Triangle area and we drove around to look at potential homes and neighborhoods. The first thing we noticed when we visited this house was how much thought and detail had been put into the home’s design. We also immediately recognized the high quality of the construction. Once we began the purchase process, Mr. Walker was extremely accommodating with us. Since we were living out of town, he took time to meet with us on a Saturday to discuss a few final details that we wanted to add to the home to make it fit our needs. We were extremely pleased with how easy it was to work with the Walker DesignBuild team throughout the entire process. They have also been very helpful by providing us with great resources and references for various services, and that has made a difference in making the house our home as we have settled in. Our careers have required us to make several moves, and we have bought and sold many homes. Working with Walker DesignBuild has been the most professional and the easiest in all of our experiences! We would be happy to refer other homebuyers to this jewel of a company! Walker DesignBuild did a fantastic job for my wife and me in giving us a new driveway, a carport, and a storage shed addition. They did the job on time, as scheduled, and on budget… We are very pleased with the quality of their work. The roof of the storage shed ties in seamlessly with the roof of our house. You would never know that it wasn’t a part of the original plan. In talking with Randy and Wes prior to selecting them to do the job, we were impressed that they said one of them would be onsite every day, checking to make sure the work was being executed as planned. They were true to their word in this and all other aspects. We highly recommend Walker DesignBuild to anyone seeking remodeling work. Our new space looks like it’s been here all along… That’s how skilled Randy and Wes are at creating seamless transitions. After living in our remodeled home for almost a year now, we are just as delighted today as we were when the project was completed. My advice for anyone considering a remodeling project is to not look solely at cost when making decisions. Talk to people who’ve had their home remodeled, and listen closely to what they say about their experiences. In our case, we are very, very happy with our choice to work with Walker DesignBuild. Randy and Wes put their hearts and souls into their work, and it shows. Their workmanship is excellent, they give great advice when asked, and they are just nice people. We are so pleased with what they’ve done for us. We looked all over the Triangle Area researching new home communities and custom home builders. 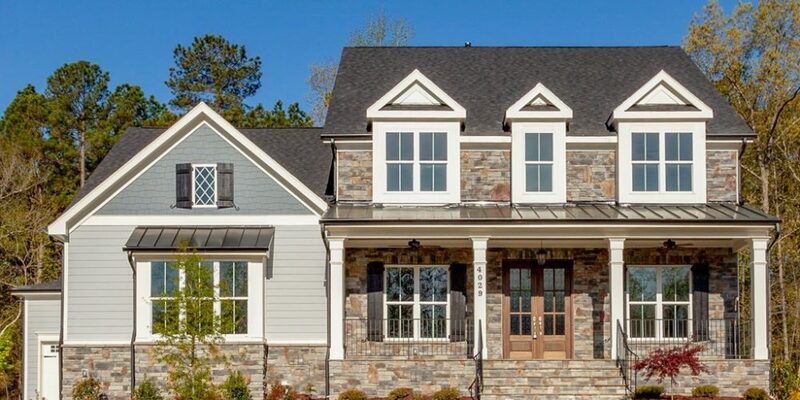 We ended up buying a lot in Cary’s Sedgefield, and we definitely thought the Walker DesignBuild homes were the most attractive. We felt that their attention to both interior and exterior details was unmatched. Their standard mouldings and finishes were definitely a step above other builders in the same price range. We wanted a unique home, and working with Walker DesignBuild and their architect allowed us to accomplish that. Together, we put our ideas on paper and designed a unique plan to fit our desires and that worked the best on the our home site. Our house couldn’t have turned out better and it takes advantage of the land features and views our lot provides. It was very easy to work with everyone at Walker DesignBuild, from Randy, Karen, and Wes, to their great handyman, Jesus! We were very happy with the entire home building process and love living in our home. We would recommend Walker DesignBuild to other people and we already have. As a builder’s/seller’s agent, I have had a wonderful working relationship with Walker DesignBuild. Ideas and information flow back and forth easily and I value the collaborative nature of our relationship. Qualities that you don’t always see with other builders is their quick communication, detailed information, and true custom building abilities. I never have to follow up with them because they are so efficient in responding to requests for information. When Walker DesignBuild provides details on what they will deliver to their clients, they leave no questions unanswered. I consistently see home buyers extremely pleased with Walker DesignBuild’s organized team approach. They work with some of the area’s most seasoned architects and are eager to create a custom plan perfect for their buyers. The beautiful curb appeal of their homes wins the hearts of buyers from the start, and their gourmet kitchens, impressive trim packages, extensive tile work, and current floor plans with energy efficient features provide clients with a place they can be proud to call home. Whether buying a finished home or designing a home from scratch, clients will enjoy working with Walker DesignBuild. My wife and I had a terrific experience with Walker DesignBuild in the renovation of our kitchen, master bath, and downstairs bath. We’ve been in our home for 18 years and had been thinking of making some updates for quite awhile, but we’d heard that remodeling work could be a nightmare. Fortunately, we had the exact opposite experience with Walker DesignBuild… Working with them was a dream. We worked primarily with Wes Walker, who is just a really nice guy and very down to earth. He listened to us and answered our questions in terms we could easily understand. Equally important, he was very honest with us. When we asked for things that were not good ideas structurally, he gave us excellent alternatives. I have nothing but good things to say… I admit that I’m pretty picky as a customer, and both my wife and I are very, very pleased with the work that was done by Wes and his outstanding team of sub-contractors. Friends have effusively complimented the renovation as well. We’re thrilled with the work Walker DesignBuild did for us, and we recommend them with no hesitation. We were relocating to the Triangle Area and while driving around to explore Pittsboro, we discovered Mann’s Crossing. After looking more closely at the community, we found a Walker DesignBuild home that was already under construction and was exactly what we were looking for. We wanted a little bit of property, and the lot provided us with the space and privacy we desired. The home, which is the Crawford II plan, was perfect for us with its first floor master suite. We were able to make a few final selections to customize the home to our needs and we found Walker DesignBuild very helpful, cooperative, and enjoyable to work with. Their experience in building custom homes and their excellent style and taste were impressive. We’re very happy in our new home and we’ll definitely recommend Walker DesignBuild to others. We were interested in custom building a home and after our Realtor showed us a completed Walker DesignBuild house, we knew right away that we wanted to work with them. Their sense of design and style, and the unique custom features in the home were what we wanted. 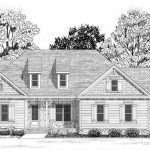 After selecting a lot in Mann’s Crossing, we began working with Randy and Wes in radically modifying a house plan that we had previously chosen. Throughout the entire process, we were impressed with the flexibility, adaptability, and openness to communication of the Walker DesignBuild team. We made many special requests and alterations during the process and often had questions and additional input, and they were always willing to listen and work with us. A very important aspect of working with Walker DesignBuild is that you have access to Randy and Wes — they are just a phone call away. Randy, Wes, and Karen get very high marks because they went the extra mile for us more than once. Without question, we would absolutely recommend Walker DesignBuild to potential home buyers. We have built before with other builders and Walker DesignBuild was the best we’ve ever worked with. We walked through several of their homes and they were very much in line with what we were looking for. The construction in every Walker home we visited was outstanding, and we were impressed with how functional the layouts were… Very logical and with minimal wasted space. We were also impressed with the standard features built into their homes. What also sets Walker DesignBuild apart is their team. Wes met us at the home we were considering and spent a great deal of time with us prior to us even putting an offer on the home. And Karen was awesome. She provided us with a detailed selection schedule with points of contact and due dates to keep the build on schedule. All we had to do was make the appointments at our convenience and get our selections in on time. She was always immediately available via phone or email for questions and even met with us and some of the vendors to answer questions. We will absolutely recommend Walker DesignBuild to others due to their great designs, high quality construction, and their team of people who care about making sure your home meets your needs. My wife Michele and I contracted with Walker DesignBuild to finish our third floor. Wes Walker and his team did a fabulous job and kept us informed on a daily basis on the status of the job. He showed a great attention to detail and did everything possible to minimize the impact of the job on our daily life. His crew was very professional and kept the job site very clean and orderly throughout the process. Wes was very attentive and accessible to all of our questions and needs. The job was finished on time and we couldn’t be happier with the result. We strongly recommend Walker DesignBuild as a first rate remodeling contractor. We lived in Amberly and enjoyed the community so much that when we began looking for a new home, we knew we wanted to stay in the neighborhood. The lot we fell in love with was owned by Walker DesignBuild, and after meeting Randy and learning about the home plan he was proposing for the lot, we immediately wanted to work with him. Ultimately, we worked directly with Wes and Karen and found that they were always very courteous, responsive, and respectful of our questions and requests. They were flexible during the building process to suit our personal needs. We truly felt like they were taking excellent care of us. We have built other homes in the past and kept comparing those experiences to this one, and found that this process was so much better thanks to the efficiency of Karen and the building team. Our experience was very positive and our home turned out really, really well! The value of our home is awesome and we look forward to raising our family here. Working with Wes Walker of Walker DesignBuild was great – excellent work, done in a timely manner, at a competitive price, and with little inconvenience to us. Wes was very considerate of our schedule and needs. He would arrive early before the workers if we needed to leave early on a particular morning. He personally oversaw every step of the project. He checked on every detail we asked about and rechecked if we had additional questions. He made suggestions and also listened to our ideas. From start to finish, he was totally professional and accountable for the renovations. He even did extra things to make our house look better than when he began. We love the finished third floor – bedroom, playroom, wet bar, full bathroom, and storage area. We would definitely choose Wes Walker and Walker DesignBuild again. As an onsite agent, responsiveness matters. When you have a potential client looking to purchase a home, you need a builder who is willing to get you information and estimates quickly. The Walker DesignBuild team is awesome to work with in every way. They are responsive to emails, texts, and phone calls. Whenever one of them isn’t available, the others are there to pick up and you don’t feel like you miss a beat. They are also very responsive in the home plans and design homes that buyers are looking for. They are quick to adjust to their market, making sure that they offer the very best for their buyers. They have been a privilege to work with in the Sunset Families for many years now and hopefully for many more successful years to come. I recently worked with Walker DesignBuild on behalf of one of my clients who was looking for a new home. We stopped by Sunset Bluffs in Fuquay Varina to explore the area, and my client liked the quality of the spec home Walker DesignBuild had open. After this visit, he determined that he would select a lot, choose a plan, and begin work on designing a custom home with the Walker DesignBuild team. From the beginning of the process, and all the way through to the end, everyone we worked with was patient and wonderful to my client, who had recently endured some difficult life events. We primarily worked with Cameron and Karen, and they were always very professional and truly listened as they made extra efforts to meet the needs of their customer. I will not hesitate to bring future clients to Walker DesignBuild! We’re very much looking forward to seeing the house! We just looked up our first contact with Randy and it was August 18, 2014. We came with no lot, no plans, and this was fully developed into a finished product (with all HOA approvals) in 301 days! Lot clearing started Dec 12, 2014 and we’ll be looking at a completed house on June 15, 2015 (185 days). Never mind that this was all done with us living 1000 miles away thanks to great communication. Thanks for everyone’s work as we approach the finish! We have enjoyed a strong relationship with the Walker family for over a decade. Walker DesignBuild has been wonderful to work with–the entire process is smooth, from selection to scheduling. Their years of experience have taught them what works, and more importantly, what doesn’t work. This experience flows from Randy, Wes, and Karen which allows them to work closely with their customers, guiding them through the task of building a home. Home buyers who are looking for a custom home building experience will get exactly that with Walker DesignBuild. Because of their honesty, integrity, communication, reliability, and personal commitment to quality, I gladly recommend Walker DesignBuild to potential home buyers.